Google's Droid provides real competition to the iPhone. Photo courtesy of scientificamerican.com. The Palm Pre was the first real challenge the iPhone faced. But it was unsuccessful, and now Google and Motorola have teamed up to make the Droid. Two or three years ago, there wasn’t a competitor in sight for the iPhone. Regardless of whether the Droid or the Pre stands a chance, it’s good for consumers that competition has arrived. The Palm Pre wasn’t very impressive. Palm, which once ruled the mobile organizer industry, has since fallen into relative obscurity. The Pre has some advantages over the iPhone, but in the end, it’s clear the iPhone is far superior. To see a detailed comparison between the Pre and iPhone, go here. But a new contender has arrived. Sprint and Palm, creators of the Pre, have less than superb reputations. But giant Google, with its smartphone operating system, Android, and the inventor of the incredibly popular Razr, are a team to contend with. Along with Verizon’s superb coverage, a real threat to the iPhone has appeared. So how does the Droid compare to the iPhone 3G S? The Droid’s web-browsing and display far surpass that of the iPhone. It features a 3.7 inch screen with 16 million hues and a brilliant 440×854 resolution screen. A big difference in web-browsing is a Flash and full HTML browser. While the iPhone can go to basic sites, it can only view Youtube videos. But the Droid, with a Flash player, can access pretty much any video your computer’s web browser can. In addition to its web-browsing, the Droid has a high quality (higher than any smartphone yet) 5-megapixel camera and is capable of recording very high quality (up to 720×480 resolution) videos. 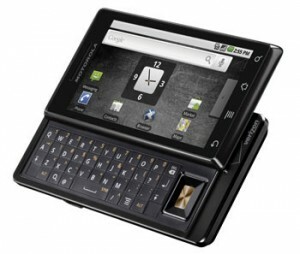 It has the thinnest QWERTY slider keyboard of any phone yet, along with buttons specifically for browsing the web. It includes 16 or 32 GB of storage space (in the form of a removable card), and has a better version of Google Maps than the iPhone. It has easy-to-use email and text messaging programs, and hundreds of applications available for download (as opposed to the Pre’s pitiful 13 apps). Droid also features a universal search, so you can search all your contacts, multimedia, text messages and the web at the same time. The only place where the Droid clearly falls short is its media player. There’s no dedicated sync program like iTunes, so you just have to drag and drop media into a folder. Video quality is decent; the quality depends on the file itself. The Droid retails for $199 with a contract, and costs the same monthly as the iPhone. It costs $150 a month for unlimited voice, text and data, or $110 for 900 minutes voice, unlimited text and 5 GB of data. Finally, the Droid has excellent call quality and superb internal performance. It can multi-task efficiently and switch between programs with almost no lag time. Overall, the Droid is a true competitor for the iPhone. Its performance, web browsing, display, video recording and navigation are all better than the iPhone’s. Granted it’s still being compared to the iPhone, so it has a ways to go. But depending on the user’s priorities, the Droid could easily be preferable.